As one of the most popular collection, Cassandra Stone is a milestone in prom fashion. World renowned for Mac Duggal's use of crystals, sequins, and all things that glitter, the staple of this shimmering collection are the embellishments. These gorgeous prom dresses feature a wide array of decorative stones and high-leg slits that promise to make any prom night unforgettable. With a more updated look at this year's Spring Collection, Mac Duggal brings in new fabrics and intricate designs. Look for patterns of chevron stripes and modern motifs this season. No girl will want to miss out on the incredible styling of Cassandra Stone. 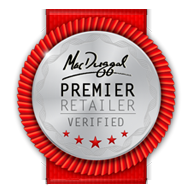 Kimberly's Prom and Bridal is an authorized Premier Retailer for Mac Duggal.